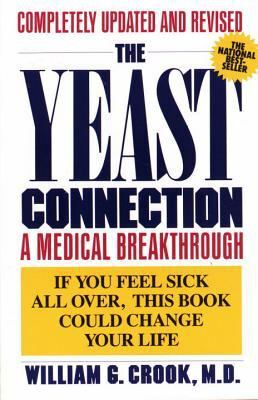 by Crook, William G., Crook, Cynthia P.
Crook, William G., Crook, Cynthia P.
The Yeast Connection tells you how to suspect, identify, and overcome the chronic and often devastating health problems related to Candida albicans, or common yeast. Yeast-connected health problems affect people of all ages and both sexes. Common symptoms include: Fatigue Irritability Premenstrual Syndrome (PMS) Digestive Disorders Muscle Pain Short Attention Span Headache Memory Loss Vaginitis Skin Problems Impotence Hyperactivity Depression Hypoglycemia Menstrual Problems Urinary Disorders Respiratory Problems Learning Difficulties "Incurable" diseases, including psoriasis, multiple sclerosis, chronic hives, autism, and arthritis, may also be yeast connected. The Yeast Connection also includes: 1. Easy-to-follow diet instructions; 2. Information about laboratory studies and tests, prescription and nonprescription medications, and treatment with candida vaccines; 3. A discussion of the yeast connection to AIDS, suicidal depression, and sexual dysfunction; 4. Recommendations for vitamins, minerals, vegetable oils, garlic, and Lactobacillus acidophilus.Crook, William G. is the author of 'Yeast Connection A Medical Breakthrough', published 1986 under ISBN 9780394747002 and ISBN 0394747003.